Atletico Madrid and Real Madrid take on each other in the UEFA Champions League Final 2016 at the San Siro. Both teams will look to seal their respective seasons with the biggest prize in European Club football neatly tucked into their cabinets in what will be an all-Spanish (in fact an all-Madrid) final for the second time in three years. The two sides had met in the final of the 2014 UEFA Champions League where Real Madrid ran out 4-1 winners in a game that was dragged to extra time through much drama courtesy an injury time equalizer from Sergio Ramos. 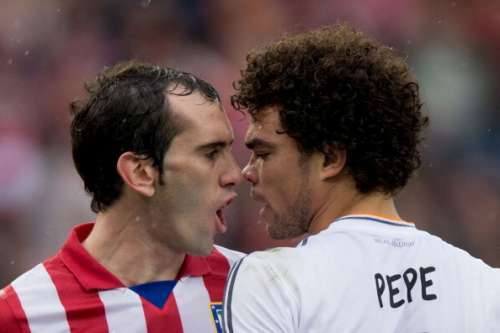 The drama will only add to the occasion as the Spanish teams continue to dominate Europe’s premier club competitions. Atletico Madrid have a full strength squad to choose from albeit with Tiago set to miss out on a start having returned from a long-term injury in the last game. His place alongside Gabi will be taken by one of Koke or Augusto Fernandez. Aside from that, Atletico will also look to field a full strength eleven. Cristiano Ronaldo has played down fears of an injury after limping out of an open media training session on Tuesday and is set to start. There’s heartbreak for Raphael Varane however, as he is set to miss out on the final owing to a thigh injury. 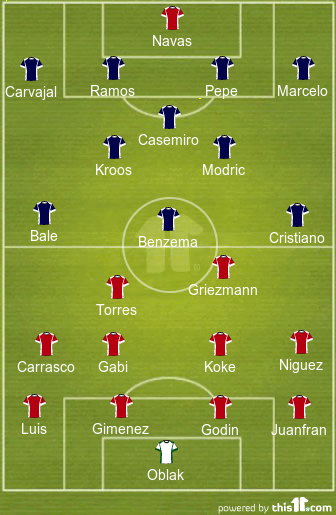 Apart from that Zinedine Zidane will be set to field his strongest possible eleven. Atletico Madrid ended their season with two losses in their last five games. Their slip up against Levante cost them a chance to take part in the La Liga title battle in the final day. However, like their local rivals, they have a chance to lift the Champions League to drown away the disappointment. Their last Champions League game however was a loss to Bayern Munich, which eventually meant they progressed on away goals. Real Madrid took the race for La Liga to the last day with Barcelona needing a win to tie up the title which they did. However, Real Madrid’s form under Zinedine Zidane has been fantastic. The final few weeks had Real breathing down Barcelona’s neck and they will look to quell the disappointment of missing out on the La Liga title with a fine victory on the night of nights. “I love having 113 years of history on my shoulders..
“I expect a very tense and balanced match at first. The presence of Casemiro allows our opponents to regroup better when they don’t have the ball, while maintaining their attacking strength. “We’ll see who wins the midfield battle at the start of the match, although Madrid may play more football due to having more technical quality. “The only failure is not to give everything on the day. We have had time to prepare properly so let’s see how it goes on Saturday. “It’s not enough just to have the ball. We are playing against a team that not only defends well – people talk about how well they defend – but Atletico Madrid are a very complete side. "You don't know what could happen. All I can say is we are very ready for the game. "We are just one game away. We are all very happy to be in this final and ready is the word. That's all. There is just one more night to go, sleep tonight and tomorrow play a great final. Old rivalries will be fought out on the ultimate stage as Real Madrid forward Karim Benzema will look to quell his disappointment at being left out of France’s squad for Euro 2016. The Frenchman is at the top of his game and will be out to prove that he is the man for the big occasion by powering his club to Champions League glory to make it 8 trophies in 7 seasons with the Spanish club. Diego Godin on the other hand, has been part of what can be best described as a defensive behemoth that is the Rojiblancos defense. To finish a season which has seen Atletico record more clean sheets than they have let goals in is unheard of mostly and is a right appraisal of the side. To be a part of this defense is the greatest of compliments to a defender and Godin has a strong claim to be called the best defender on the planet at the moment. The pace and power of Benzema are set to meet the iron clad will of Diego Godin in a battle that is quite set up to be the battle of the evening. Fernando Torres must feel he is dreaming. Just a year and a half ago, he was being hurriedly offloaded by an AC Milan side that was of the opinion that it was indeed getting the better end of a deal by receiving Alessio Cerci in a deal which had Torres arriving at his boyhood club on loan. Here he is now, playing a Champions League final with that team and having contributed strongly to the campaign. Fernando Torres typifies Atletico Madrid much as his national teammate Sergio Ramos. The duo has lifted many a trophy together and will look to go head to head to compete for this one on the night. Torres has been the bane of Real Madrid in his career having in an iconic manner ripped apart a Galactico defense in the Champions League when he played for Liverpool. This was at the peak of his powers, if he does manage even a small ounce of that performance on this night, Atletico will have a good chance of winning it. That is of course if Sergio Ramos allows him any space on the night. Atletico Madrid are not favorites for this game in most quarters. However, these nights are all about drama and destiny. One feels that destiny is on Atletico’s side on the night.